Follow the links below for information about the FOGO Trial. The City of Melville, City of Fremantle and Town of East Fremantle are set to become the first councils in the Perth Metropolitan area to investigate the rollout of a three bin Food Organic Garden Organic (FOGO) system to local residents. City of Melville recently voted unanimously to undertake a trial of the FOGO system to 7,000 households in the City of Melville. The trial is anticipated to commence early in October 2017 and following evaluation of community feedback and waste recovery data, a decision will be made on the implementation of the system across the remainder of the City of Melville, the City of Fremantle and Town of East Fremantle in 2018/19. The new system will provide more options for residents to separate their waste with the aim of producing a cleaner compost, sending less waste to landfill and reducing costs. The project is a collaboration between all three councils and the Southern Metropolitan Regional Council as part of the Regional Strategic Waste Management Plan adopted in 2016. The changes will take place with residents receiving a brand new 240L lime-green lid bin for food organic and garden organic (FOGO) material, which will be collected weekly. They will also be provided with a kitchen caddy and compostable bin liners to help them separate their waste in the kitchen. The material from this bin will be turned into high-quality compost at the Regional Resource Recovery Centre in Canning Vale. 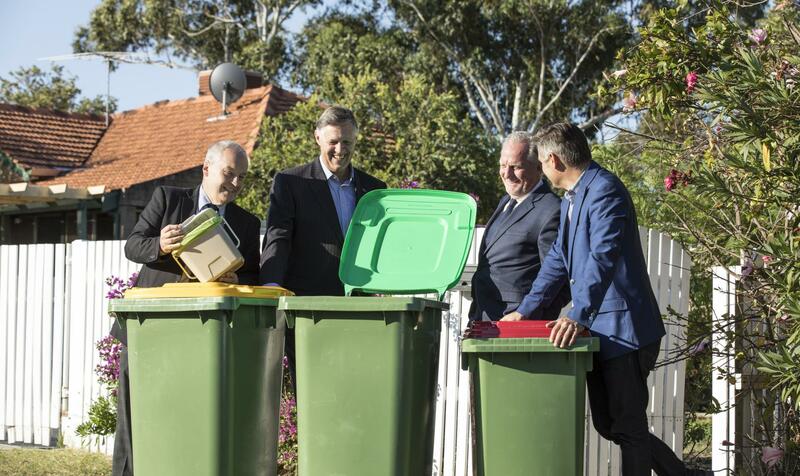 Residents will also receive a brand new smaller 140L red-lid bin, which will be collected fortnightly and will be for general rubbish items that can’t be either composted or recycled through their household bins. The two news bins will replace the old dark-green general waste bin with the current yellow lid recycling bin to remain. The recycling bin will be collected fortnightly under the FOGO system. Fortnightly recycling should be enough for most households, however during the trial residents who find they don’t have enough room will be able to upgrade to a larger 360L bin free of charge. The three bin system being introduced is different to other three bin systems implemented around the Perth metropolitan area. Currently all councils in the Perth metropolitan area with a three-bin system only allow for garden materials in their green bin, leaving valuable food waste to rot away in landfill sites, producing harmful greenhouse gases. All comments may be attributed to Councilor Cameron Schuster, SMRC Chairperson.